paying respect to Michael Brown at Afropunk Fest, Brooklyn. Brooklyn is home to some of hip-hop’s greatest rap engineers. I came down to BK to explore the sites and to attend Afropunk Fest. The festival has evolved from its core punk roots to reflect broader aspects of African-American culture through the arts, film and music. The festival continues to run each August in its home of Brooklyn, and has expanded to cover Atlanta GA, Paris France, London UK and Johannesburg South Africa! My first introduction to Brooklyn was in the neighborhood of Williamsburg, known for its hipster outings and endless vibes. I immediately fell in love with Willie’burg. wrap dresses are so fun in the summer! I found this light frock brought out my most feminine side, and kept me cool in the August heat as I strolled Williamsburg. Andy Warhol x Jean-Michel Basquiat. Now THAT's a match I'd be willing to bet on. Kobra, the artist behind the mural, uses this hashtag to defend the right to urban public spaces. The right to urban spaces is a theory heavily explored in urban planning. The use and intention of public spaces collide as urban planners try to dignify who actually has the use of public spaces, and how to create an inclusive process that maximizes the intent of urban spaces. The #FightforStreetArt fits in this facet, as inclusion of artists and their right to public spaces is defined through their use of street art, creating murals showcased throughout the city. As populations in large cities like New York City continue to multiply, the use of public spaces continues to be a conversation about diversity, inclusion and the right to urban everyday life. Growing income inequality throughout major American cities and states will pronounce this problem as more urban areas have LESS access to green, open, and public spaces. Creating a balance to ensure the right to the city will remain for all will be a testament to our abilities to include everyone in these urban platforms. When it comes to food in Brooklyn, options are abound. We decided to test the hype out of newcomer Sweet Chick. 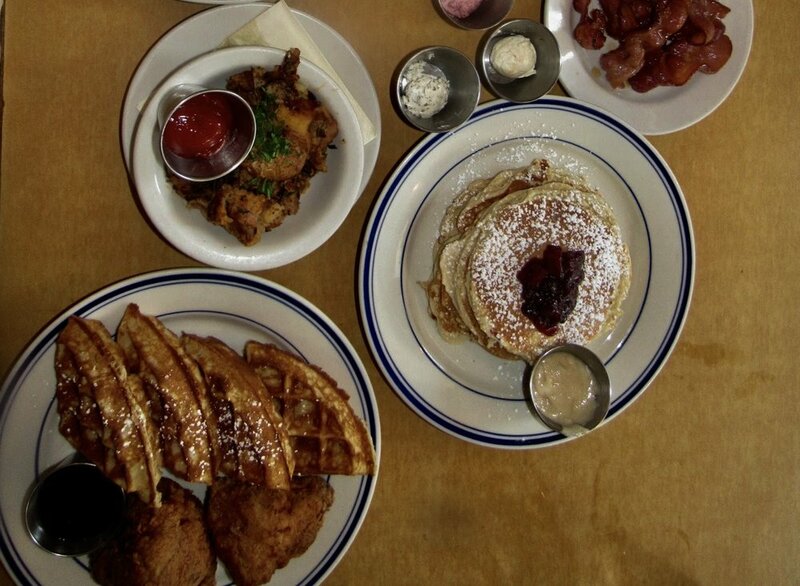 This eatery co-owned by rapper Nas (also known as #bae) specializes in Southern comfort food with a twist. We enjoyed a great brunch, along with a great cozy environment. This is a place I'd definitely try to get to early as there are no reservations for brunch, but well worth the wait! With locations in Brooklyn as well as Manhattan, and Ricotta pancakes that make you put your waist beads to the side (or off completely! ), Sweet Chick deserves the hype. We were not ready for the beauty that was Afropunk Fest. Everywhere you looked was a sea of gorgeous black + brown people congregating and being rightfully their full selves. I met so many amazing creatives, and left truly inspired. For this Brooklyn edition, we will let the Afropunk guests be the ART. fishnets x plaids will never, evah go out of style! Her silver booties killed me! Slay, slay sis! accessorize your look with an oversized scarf, or a beret and feel your outfit elevate. ready for SZA show serving major "Love Galore" vibes. We spotted this vegan ice cream truck in Willie'burg and thought- HUH?? vegan ice cream? Judge not! Van Leeuwen vegan ice cream truck offers a delicious selection of ice creams with a base made with cashew milk! Their vegan cookies and cream caramel swirl was to die for! Typical ingredients include: cashew or coconut milk, cane sugar, and mostly organic selections of nuts and syrups. The NYC bred business has been in operation since 2008 and all flavors are made from scratch. All in all, Brooklyn is a true summer dream. Full of unexpected surprises in every corner, Brooklyn is a testament to the old + new through its expansion, its current (losing) battle with gentrification all while trying to hold on to its core roots. Brooklyn is a resilient one however, and one thing I learned from Brooklynites is that they won't take anything sitting down. About writer: Beya J. is a city planner, interested in travel, writing + urban settings. Through her travels, Beya has been able to explore and participate in extensive cultural immersions to learn more about world religions, politics and music.